Many thanks for your donation – it is greatly appreciated. 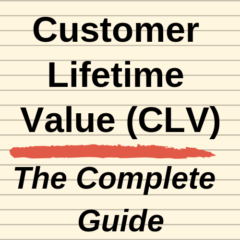 Customer equity is the total of all customer lifetime values of both current and future customers (please refer to this article for more information on how it is calculated). This means that customer equity is a single measure of all future profits (on a discounted basis) that will be generated by the firm’s (or brand’s) customers. Therefore, total customer equity is a metric that can measure the value and contribution of ALL marketing activities up to that point in time, taking into account both short-term and long-term expected profits from customers.